HEPA filtets can not be cleaned they are replaced. HEPA filters are protected by pre filters and bag filters. Are bag filters installed in all cases? As mentioned before HEPA filter cannot be cleaned. HEPA filters have to be replaced in a period of 5~10 years depending on the product and pre filters. After installation of new filters a leak test has to be performed to validate the filters. 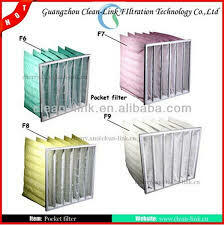 We are having only prefilters followed by fine filters but no bag filters. Depending on the application and process a dedicated filter system has to be designed. Pre-filter is the first filter installed, for example in AHU to prevent dust particle particle to pass through air. It can also be called micro filter and is around 5 micron. It means that particles of more than 5 microns per cubic ft cannot pass through that filter. Hepa filter on the other hand can be EU-13 or EU-14 filter of 0.3micron. It means that particles of more than 0.3 microns per cubic ft cannot pass through that filter. This filter is highly recommended in hospitals and pharma industries to control contamination. Bag filter is called BIBO. Bag in bag out system or bibo housing. The purpose of the bibo is also to prevent contamination. The filter in this bag type can be a hepafilter or pre filter depending upon the user’s air filtration needs. It is better to understand the application and/or process this filter are being used. Do you have any reference said the HEPA filter replace in a period 5-10 years? I have to revise my statement. I should not have used the word “HAVE TO BE”. Changing HEPA filters 5-10 years is my experience point of view. As we known, according to GMP, the filter has to be free of leaks. This is verified by qualification and regularly performed leak tests as per ISO 14644-3, which are mandatory for sterile facilities. From a practical viewpoint, one could say that the maximum duration of use depends directly on the pressure drop. Changing the filters only makes sense if the pressure drop gets too high. Sir,i have doubt related to hepa filter in auto coater. What are the procedures to replace the old filter because of not achieving inlet temperature properly.then how to prove which is not working. 5_10 yrs is a brry long duration.in a duty enviorenment if they r chocked should replace earlier. In Auto coater if inlet temperature is not achieved following may be the reasons. Steam sensor is not wrking properly. Poor performance of inlet blower. Most of the time period HEPA remains protected so no need to be replaced.Mesh n bag filters r chocked for that mesh filters r washed n bag filters r cleaned. To avoid from this situations mesh n bag filters should be cleaned weekly or depending upon mature of process time. What you meant by mesh filter?